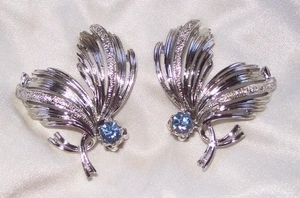 EARRINGS - EMMONS. ABSOLUTELY HUGE SILVERTONE FLOWER OR LEAF DESIGNs WITH A LARGE LIGHT BLUE RHINESTONE ACCENT. about 2" LONG, 1 3/4" ACROSS. VERY GOOD CONDITION WITH SOME LIGHT WEAR TO THE FINISH ALONG THE TEXTURED RIDGES.